It is quite some years since the “males” have dominated Simmental proceedings on the beautiful tree-lined lawn, which one can only associate with the RUAS Balmoral Show. And so, for 2009 at least, they laid claim to all the plaudits and glory when it came their way. For exhibitors and animals making their debuts, it was to prove a triumphant start to the show season and none more so than the Supreme and Male Champion, Banwy T-Rex, lifting the red, white and blue ribbons for Southern Irish breeders, the Behan family, from Cloneygowan, Ballyfinn, Port Laois, who were making their first excursion north of the border. No stranger to success, having lifted the championship honours at major shows south of the border last year, this impressive stock bull has had a very colourful international and much travelled history to date. With a Scottish dam, Skerrington Hycinth 8th, and English sire, Sterling Nelson 2nd, born and bred in Wales by R. E. Jones, sold at the Autumn 2007 Perth Bull Sales for 8,500 gns, to travel across the Irish sea and make his home in County Laois. 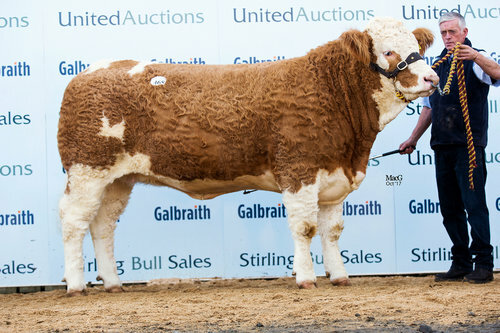 “A tremendous bull of power and scale with excellent locomotion, he was just impossible to pass,” the comments of Scottish judge, Robert McGregor, Kirkton of Mailer, Perth, who went on to place as Reserve Supreme and Reserve Male Champion, Slievenagh Wyatt, who had earlier lifted the Junior Championship. This March 2008 born son of Kilbride Farm Newry was forward from the Slievenagh herd of R. J. Boyd, Portglenone. “A nice sweet young bull displaying all the breed characteristics you would look for, great top, wide on the plates and good hindquarters,” stated the judge. On the female side, Ranfurly Weikel 3rd, came up trumps for the Hazelton family, Dungannon. Winning the red rosette in the 2008 born junior heifer class and lifting the reserve junior championship, this Hillcrest Champion sired heifer displayed tremendous style in the ring culminating in her lifting the overall female championship. Bred from a highly successful show cow, South Park King Kong Weikel, who has three reserve female of the year titles to her credit, her daughter has got off to a great start in the race for the 2009 Northern Bank sponsored Female of the Year title. Reserve in the female stakes, was the winner of the senior cow class, Milton Senhorita. Sired by Rosten Barney and bred from Milton Hilary, this cow was from the same home as the Supreme Champion and with a very nice heifer calf at foot by T-Rex, put the icing on the cake for the Behan family. Results from the judging ring: Cow, born before 1st January 2006, in calf or in milk having had at least one calf – 1, Clonagh Herds, Milton Senhorita; 2, W. A. Weatherup, Ballyvallough Sheila. Cow or heifer, born in 2006, in calf or with calf at foot having had a calf by three years old – 1, Johnathan Farrell, Woodford Tulip. Heifer, born on or after 1st January 2007 and on or before 30th June 2007 – 1, Johnathan Farrell, Woodford Snowdrop; 2, S. & P. McDonald, Camus Valentine; 3, W. A. Weatherup, Ballyvallough Valentine. Heifer, born on or after 1st July 2007 and on or before 31st December 2007 – 1, Clonagh Herds, Clonagh Venus Grace; 2, S. & P. McDonald, Raceview Veda; 3, Alan and Ann Kennedy, Woodford Snow White. Heifer, born on or after 1st January 2008 – 1, W. D. Hazelton, Ranfurly Weikel 3rd; 2, Johnathan Farrell, Corhammock Ginger Lily; 3, J. L. and C. J. Weatherup, Lisglass Wallflower. Bull, born on or after 31st December 2007 – 1, Clonagh Herds, Banwy T-Rex. Bull born on or after 1st January 2008 – 1, R. J. Boyd, Slievenagh Wyatt; 2, J. H. J. Henderson, Burndennett Wringer; 3, T. H. Gorman, Woodford Warrior. Pair of Animals, bona fide the property of one exhibitor and entered in the classes for which they are eligible – 1, Clonagh Herds; 2, S. & P. McDonald; 3, W. D. Hazelton. Championship awards: Supreme and Male Champion: Clonagh Herds, Banwy T-Rex. Reserve Supreme, Reserve Male Champion and Junior Champion: R. J. Boyd, Slievenagh Wyatt. Female Champion and Reserve Junior Champion: W. D. Hazelton, Ranfurly Weikel 3rd. Reserve Female Champion: Clonagh Herds, Milton Senhorita.